Why is Wilfrid Jury’s office here? 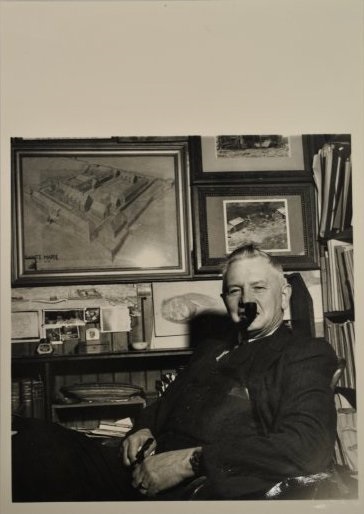 Well, Wilfrid Jury, and his office, played a big part in the establishing and development of the Museum. Before the Museum was built on Attawandaron Road, Wilfrid and his father Amos began the Museum at the University of Western Ontario. In 1927 they started the Museum using artifacts from their own collections. The majority of Wilfrid’s work, from the writing of excavation notes on the sites he had researched, to the curation of the museum, was completed in his office. Wilfrid also used his office as a collection space. He kept a number of the artifacts he had been gifted from across Canada, or had discovered himself, in his office. The office we have on display is a reconstruction of Wilfrid’s office from around the 1950s. At the time his office was in the basement of Middlesex College at Western. He would often display artifacts in the hallway so passers-by could take a look. 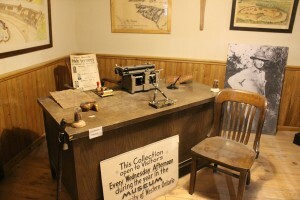 When the Museum opened on Attawandaron Road in 1984, the curators decided to include an exhibit featuring Wilfrid’s office furniture and supplies. The recreation now has a permanent home in the Museum as we honour his family’s legacy in London archaeology. After all, without all of the collections work, writing, and compiling Wilfrid did in his office the Museum probably would not have nearly as many artifacts, or be the repository of so much information, let alone exist.